This article is about a commonly cultivated crop plant. For other uses, see Buckwheat (disambiguation). Not to be confused with bulgur wheat. Buckwheat (Fagopyrum esculentum), or common buckwheat, is a plant cultivated for its grain-like seeds and as a cover crop. A related and more bitter species, Fagopyrum tataricum, is a domesticated food plant common in Asia and Central and Eastern Europe. Despite the name, buckwheat is not related to wheat, as it is not a grass. Instead, buckwheat is related to sorrel, knotweed, and rhubarb. Because its seeds are rich in complex carbohydrates, it is referred to as a pseudocereal. The name "buckwheat" or "beech wheat" comes from its triangular seeds, which resemble the much larger seeds of the beech nut from the beech tree, and the fact that it is used like wheat. The word may be a translation of Middle Dutch boecweite: boec (Modern Dutch beuk), "beech" (see PIE *bhago-) and weite (Mod. Dut. weit), wheat, or may be a native formation on the same model as the Dutch word. The wild ancestor of common buckwheat is F. esculentum ssp. ancestrale. F. homotropicum is interfertile with F. esculentum and the wild forms have a common distribution, in Yunnan, a southwestern province of China. The wild ancestor of tartary buckwheat is F. tataricum ssp. potanini. Common buckwheat was domesticated and first cultivated in inland Southeast Asia, possibly around 6000 BCE, and from there spread to Central Asia and Tibet, and then to the Middle East and Europe. Domestication most likely took place in the western Yunnan region of China. The oldest remains found in China so far date to circa 2600 BCE, while buckwheat pollen found in Japan dates from as early as 4000 BCE. It is the world's highest-elevation domesticate, being cultivated in Yunnan on the edge of the Tibetan Plateau or on the plateau itself. Buckwheat was one of the earliest crops introduced by Europeans to North America. Dispersal around the globe was complete by 2006, when a variety developed in Canada was widely planted in China. In India, buckwheat flour is known as kuttu ka atta and is culturally associated with the Navratri festival. On the day of this festival, food items made only from buckwheat are consumed. Salicylaldehyde (2-hydroxybenzaldehyde) was identified as a characteristic component of buckwheat aroma. 2,5-dimethyl-4-hydroxy-3(2H)-furanone, (E,E)-2,4-decadienal, phenylacetaldehyde, 2-methoxy-4-vinylphenol, (E)-2-nonenal, decanal and hexanal also contribute to its aroma. They all have odour activity value more than 50, but the aroma of these substances in an isolated state does not resemble buckwheat. In a 100-gram serving providing 343 calories dry and 92 calories cooked, buckwheat is a rich source (20% or more of the Daily Value, DV) of protein, dietary fiber, four B vitamins and several dietary minerals, with content especially high (47 to 65% DV) in niacin, magnesium, manganese and phosphorus (table). Buckwheat is 72% carbohydrates, including 10% dietary fiber, 3% fat and 13% protein (table). As buckwheat contains no gluten, it may be eaten by people with gluten-related disorders, such as celiac disease, non-celiac gluten sensitivity or dermatitis herpetiformis. Nevertheless, buckwheat may have gluten contamination. Cases of severe allergic reactions to buckwheat and buckwheat-containing products have been reported. Buckwheat contains fluorescent phototoxic fagopyrins. Seeds, flour, and teas are generally safe when consumed in normal amounts, but fagopyrism can appear in people with diets based on high consumption of buckwheat sprouts, and particularly flowers or fagopyrin-rich buckwheat extracts. Symptoms of fagopyrism in humans may include skin inflammation in sunlight-exposed areas, cold sensitivity, and tingling or numbness in the hands. Buckwheat noodles have been eaten by people from Tibet and northern China for centuries, as wheat cannot be grown in the mountain regions. A special press made of wood is used to press the dough into hot boiling water when making buckwheat noodles. Old presses found in Tibet and Shanxi share the same basic design features. The Japanese and Koreans may have learned the making of buckwheat noodles from them. In India, on Hindu fasting days (Navaratri, Ekadashi, Janmashtami, Maha Shivaratri, etc. ), fasting people in northern states of India eat foods made of buckwheat flour. Eating cereals such as wheat or rice is prohibited during such fasting days. However, since buckwheat is not a cereal, it is considered acceptable for consumption during Hindu fasting days. While strict Hindus do not even drink water during their fast (observing Nirjal Upwas), others just give up cereals and salt and take a meal prepared from non-cereal ingredients such as buckwheat (kuttu). The preparation of buckwheat flour varies across India. Well-known buckwheat flour recipes are kuttu ki puri (buckwheat pancakes) and kuttu pakoras (potato slices dipped in buckwheat flour and deep-fried in oil). In most of the northern and western states, buckwheat flour is called kuttu ka atta. Buckwheat noodles play a major role in the cuisines of Japan (soba), Korea (naengmyeon, makguksu and memil guksu), buckwheat fresh pasta (pasta di grano saraceno) in Apulia region of Southern Italy and the Valtellina region of Northern Italy (pizzoccheri). Soba noodles are the subject of deep cultural importance in Japan. In Korea, guksu (noodles) were widely made from buckwheat before it was replaced by wheat. The difficulty of making noodles from flour with no gluten has resulted in a traditional art developed around their manufacture by hand. Buckwheat groats are commonly used in western Asia and eastern Europe. The porridge was common, and is often considered the definitive peasant dish. It is made from roasted groats that are cooked with broth to a texture similar to rice or bulgur. The dish was brought to America by Ukrainian, Russian, and Polish immigrants who called it kasha, and they mixed it with pasta or used it as a filling for cabbage rolls, knishes, and blintzes; buckwheat prepared in this fashion is thus most commonly called kasha in America. Groats were the most widely used form of buckwheat worldwide during the 20th century, eaten primarily in Estonia, Russia, Ukraine, Belarus, and Poland, called grechka in Ukrainian or Russian. The groats can also be sprouted and then eaten raw or cooked. Buckwheat pancakes, sometimes raised with yeast, are eaten in several countries. They are known as buckwheat blinis in Russia, galettes in France (savoury crêpes made with buckwheat flour, water, and eggs are associated with Lower Brittany, whilst savoury galettes made without eggs are from Upper Brittany), ployes in Acadia, and boûketes (which are named after the buckwheat plant) in the Wallonia region of Belgium. Similar pancakes were a common food in American pioneer days. They are light and foamy. The buckwheat flour gives them an earthy, mildly mushroom-like taste. In Ukraine, yeast rolls called hrechanyky are made from buckwheat. Buckwheat flour is also used to make Nepali dishes such as dhedo and kachhyamba. Farina made from groats are used for breakfast food, porridge, and thickening materials in soups, gravies, and dressings. In Korea, buckwheat starch is used to make a jelly called memilmuk. It is also used with wheat, pasta and bread products in Apulia Italy, maize (polenta taragna in northern Italy) and rice. Buckwheat tea, known as memil-cha (메밀차) in Korea and soba-cha (そば茶) in Japan, is a tea made from roasted buckwheat. 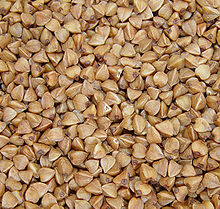 Buckwheat hulls are used as filling for a variety of upholstered goods, including pillows and zafu. The hulls are durable and do not insulate or reflect heat as much as synthetic filling. They are sometimes marketed as an alternative natural filling to feathers for those with allergies. However, medical studies to measure the health effects of pillows manufactured with unprocessed and uncleaned hulls concluded that such buckwheat pillows do contain higher levels of a potential allergen that may trigger asthma in susceptible individuals than do new synthetic-filled pillows. In the northeastern United States, buckwheat was a common crop in the 18th and 19th centuries. Cultivation declined sharply in the 20th century due to the use of nitrogen fertilizer, to which maize and wheat respond strongly. Over 1,000,000 acres (400,000 ha) were harvested in the United States in 1918. By 1954, that had declined to 150,000 acres (61,000 ha), and by 1964, the last year annual production statistics were gathered by USDA, only 50,000 acres (20,000 ha) were grown. However, it may benefit from an "explosion in popularity of so-called ancient grains" reported in the years 2009-2014. In 2016, world production was 2.4 million tonnes, led by Russia with 50% of the world total, followed by China with 17% and Ukraine with 7%. ^ "USDA GRIN Taxonomy". Retrieved 16 December 2014. ^ "Online Etymology Dictionary". Etymonline.com. Retrieved 2013-11-24. ^ Ohnishi, O.; Matsuoka, Y. (1996). "Search for the wild ancestor of buckwheat II. Taxonomy of Fagopyrum (Polygonaceae) species based on morphology, isozymes and cpDNA variability". Genes and Genetic Systems. 71 (6): 383–390. doi:10.1266/ggs.71.383. ^ Ohnishi, O (1998). "Search for the wild ancestor of buckwheat III. The wild ancestor of cultivated common buckwheat, and of tatary buckwheat". Economic Botany. 52 (2): 123–133. doi:10.1007/BF02861199. ^ Bhaduri, Niti Pathak; Prajneshu, Meenakshi (2016). "Kuttu (Buckwheat): A Promising Staple Food Grain for Our Diet". Journal of Innovation for Inclusive Development. 1: 43–45. ^ a b ] Stone, J. L. (1906). Buckwheat. Agricultural experiment station of the College of Agriculture Department of Agronomy (Bulletin 238 ed., pp. 184-193). Ithaca, New York, United States: Cornell University. ^ a b Li, S.; Zhang, Q. H. (2001). "Advances in the development of functional foods from buckwheat". Food Science and Nutrition. 41 (6): 451–464. doi:10.1080/20014091091887. PMID 11592684. ^ a b T. Björkman; R.R. Bellinder; R.R. Hahn & J. Shail (2008). Buckwheat cover crop handbook. Cornell University. ^ Agriculture Canada. (1978). Growing buckwheat. Ottawa Canada: Canadian Department of Agriculture. ^ Quisenberry, K. S., & Taylor, J. W. (1939). Growing buckwheat. Farmers' bulletin (No.1835 ed., pp. 1-17) U.S. Department of Agriculture. ^ Skrabanja V; Kreft I; Golob T; Modic M; Ikeda S; Ikeda K; Kreft S; Bonafaccia G; Knapp M; Kosmelj K (2004). "Nutrient content in buckwheat milling fractions". Cereal Chemistry. 81 (2): 172–176. doi:10.1094/CCHEM.2004.81.2.172. ^ Skrabanja V, Laerke HN, Kreft I (September 1998). "Effects of hydrothermal processing of buckwheat Fagopyrum esculentum Moench) groats on starch enzymatic availability in vitro and in vivo in rats". Journal of Cereal Science. 28 (2): 209–214. doi:10.1006/jcrs.1998.0200. ^ Skrabanja V; Elmstahl HGML; Kreft I; Bjorck IME (January 2001). "Nutritional properties of starch in buckwheat products: Studies in vitro and in vivo". Journal of Agricultural and Food Chemistry. 49 (1): 490–496. doi:10.1021/jf000779w. PMID 11170616. ^ "Buckwheat Profile - Agricultural Marketing Resource Center". Agmrc.org. Retrieved 2013-11-24. ^ Bonafaccia G, Marocchini M, Kreft I (2003). "Composition and technological properties of the flour and bran from common and tartary buckwheat". Food Chemistry. 80 (1): 9–15. doi:10.1016/S0308-8146(02)00228-5. ^ S. Ikeda; Y. Yamashita & I. Kreft (2000). "Essential mineral composition of buckwheat flour fractions". Fagopyrum. 17: 57–61. ^ Bonafaccia, G.; L. Gambelli; N. Fabjan & I. Kreft (October 2003). "Trace elements in flour and bran from common and tartary buckwheat". Food Chemistry. 83 (1): 1–5. doi:10.1016/S0308-8146(03)00228-0. ^ Kreft S, Knapp M, Kreft I (November 1999). 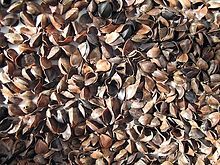 "Extraction of rutin from buckwheat (Fagopyrum esculentum Moench) seeds and determination by capillary electrophoresis". Journal of Agricultural and Food Chemistry. 47 (11): 4649–52. doi:10.1021/jf990186p. PMID 10552865. ^ "Phenol-Explorer: Showing report on Cereals". Phenol-explorer.eu. Retrieved 2013-11-24. ^ a b Eguchi K, Anase T, Osuga H (2009). "Development of a High-Performance Liquid Chromatography Method to Determine the Fagopyrin Content of Tartary Buckwheat (Fagopyrum tartaricum Gaertn.) and Common Buckwheat (F. esculentum Moench)". Plant Production Science. 12 (4): 475–480. doi:10.1626/pps.12.475. ^ Ožbolt L, Kreft S, Kreft I, Germ M, Stibilj V (2008). "Distribution of selenium and phenolics in buckwheat plants grown from seeds soaked in Se solution and under different levels of UV-B radiation". Food Chemistry. 110 (3): 691–6. doi:10.1016/j.foodchem.2008.02.073. ^ Tavčar Benković E, Žigon D, Friedrich M, Plavec J, Kreft S (2014). "Isolation, analysis and structures of phototoxic fagopyrins from buckwheat". Food Chemistry. 143: 432–439. doi:10.1016/j.foodchem.2013.07.118. PMID 24054263. ^ Janes D, Kreft S (2008). "Salicylaldehyde is a characteristic aroma component of buckwheat groats". Food Chemistry. 109 (2): 293–8. doi:10.1016/j.foodchem.2007.12.032. PMID 26003350. ^ Janes D, Kantar D, Kreft S, Prosen H (1 January 2009). "Identification of buckwheat (Fagopyrum esculentum Moench) aroma compounds with GC-MS". Food Chemistry. 112 (1): 120–4. doi:10.1016/j.foodchem.2008.05.048. ^ a b Ciacci C, Ciclitira P, Hadjivassiliou M, Kaukinen K, Ludvigsson JF, McGough N, et al. (2015). "The gluten-free diet and its current application in coeliac disease and dermatitis herpetiformis". United European Gastroenterol J (Review). 3 (2): 121–35. doi:10.1177/2050640614559263. PMC 4406897. PMID 25922672. ^ "Eating, Diet, & Nutrition for Celiac Disease". National Institutes of Health. June 2016. ^ Wieslander G, Norbäck D (2001). "Buckwheat allergy". Allergy (Review). 56 (8): 703–4. doi:10.1034/j.1398-9995.2001.056008703.x. PMID 11488663. ^ Benković, E. T; Kreft, S (2015). "Fagopyrins and Protofagopyrins: Detection, Analysis, and Potential Phototoxicity in Buckwheat". Journal of Agricultural and Food Chemistry. 63 (24): 5715–24. doi:10.1021/acs.jafc.5b01163. PMID 26024291. ^ Benković ET, Kreft S (2015). "Fagopyrins and Protofagopyrins: Detection, Analysis, and Potential Phototoxicity in Buckwheat". J Agric Food Chem (Review). 63 (24): 5715–24. doi:10.1021/acs.jafc.5b01163. PMID 26024291. ^ P. S. Belton; John Reginald Nuttall Taylor (2002). Pseudocereals and Less Common Cereals : grain properties and utilization potential. Springer. p. 138. ISBN 978-3-540-42939-5. ^ Sandra Louise Oliver (1 January 2005). Food in Colonial and Federal America. Greenwood Publishing Group. p. 164. ISBN 978-0-313-32988-3. ^ Carolyn Smagalski (2006). "Gluten Free Beer Festival". ^ Kim, Dakota (22 October 2015). "10 Strange and Wonderful Korean Teas". Paste. Retrieved 27 January 2017. ^ Chein Soo Hong; Hae Sim Park & Seung Heon Oh (December 1987). "Dermatophagoides Farinae, an Important Allergenic Substance in Buckwheat-Husk Pillows" (PDF). Yonsei Medical Journal. 28 (4): 274–281. doi:10.3349/ymj.1987.28.4.274. PMID 3439196. ^ Hae-Seon Nam; Choon-Sik Park; Julian Crane; Rob Siebers (2004). "Endotoxin and House Dust Mite Allergen Levels on Synthetic and Buckwheat Pillows". Journal of Korean Medical Science. 19 (4): 505–8. doi:10.3346/jkms.2004.19.4.505. ISSN 1011-8934. PMC 2816881. PMID 15308838. ^ a b c "Buckwheat production in 2016, Crops/Regions/World list/Production Quantity (pick lists)". UN Food and Agriculture Organization, Corporate Statistical Database (FAOSTAT). 2017. Retrieved 19 March 2018. ^ J. R. N. Taylor; P. S. Belton (2002). Pseudocereals and Less Common Cereals. Springer. p. 125. ISBN 978-3-540-42939-5. ^ Steve Rosenberg (28 November 2014). "How buckwheat sheds light on Russia's soul". BBC News. Retrieved 28 November 2014. ^ Joanna Jolly (16 December 2014). "Why do Americans love ancient grains". BBC News, Washington DC. Retrieved 16 December 2014. ^ Berndt LA, Wratten SD, Hassan PG (2002). "Effects of buckwheat flowers on leafroller (Lepidoptera: Tortricidae) parasitoids in a New Zealand vineyard". Agricultural and Forest Entomology. 4 (1): 39–45. doi:10.1046/j.1461-9563.2002.00126.x. Wikimedia Commons has media related to Fagopyrum esculentum (Buckwheat). Wikisource has the text of the 1911 Encyclopædia Britannica article Buckwheat.